Two ladles are made from copper, the capacity of the scoop of each ladle a known quantity of water, more or less. Let the handle of each ladle be channel discharging into the scoop. The ends of the handles are brought together at a right angle and soldered firmly together. Crosswise inside the angle is an axle whose ends, resting in firm support, move in bearing. The centre of the axle is soldered firmly inside the angle. 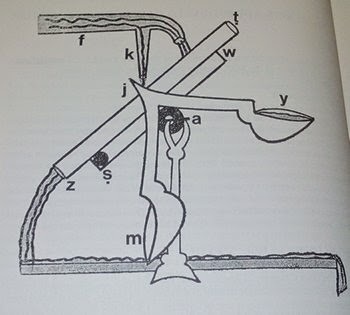 Then a water supply f is installed in which the water flows continuously and discharge from its into a channel. A little water issues from a narrow pipe K that drip into angle j. /angle j does not remain centrally between the vertical and the horizontal,. because the ball in the pipe does not remain in the centre of the pipe but at one of its end. Let it be in end s, So the scoop of ladle m will then be at the bottom and the handle of ladle y will be almost horizontal. Water dripping from pipe k will therefore run along the handle of the ladle y and collect in its scoop. The discharge from the end of water supply f will flow through channel tz and issue from end z to the right hand side of this machine until scoop y fills, becomes heavy and tilts, together with the pipe and the channel. The ball settles in ends w of the pipe and water drips from pipe k runs to the end of ladle m and collects there. The discharge from the end of water supply f goes into tz channel and issues from it ant end t into the left hand side of the machine. And continuous to flow until scoop m fills becomes heavy and tilts, empties its contents and return to its original position. This machine goes on working as long as water flows. It has six movements: two movements to the right and left by which things can be moved; two movements up and down at the right by which things can be raised and lowered; two movements up and down from left by which things and be raised and lowered. That is what I wished to explain clearly.